I was shooting an engagement party this weekend which was on the water in CT. 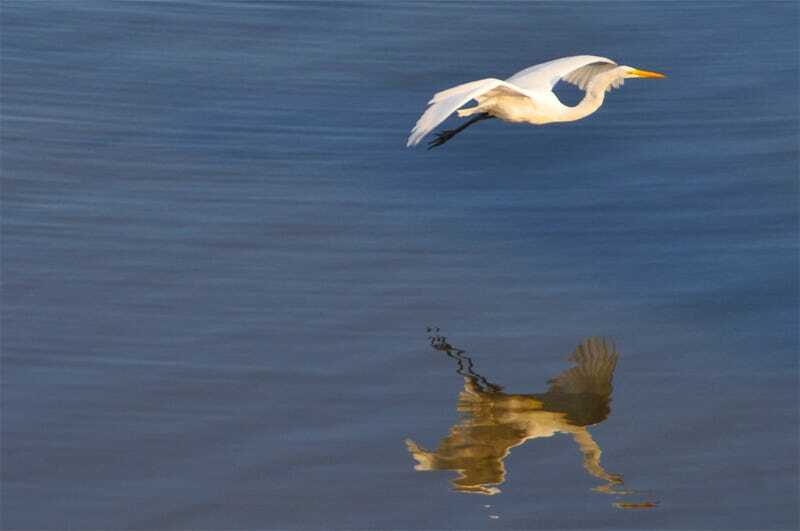 Behind my subjects I saw a beautiful egret coming in for a water landing. The color of his beak against the water is just stunning and I thought it would be a complementary image for this week's shooting challenge. There were no special settings I just zoomed and shot. I had no idea the colors would be so vibrant! I knew that outside of my house there was a bush that always has butterflies on it. I wanted to test out my new Ep-3 and I took an extreme close up of the butterfly. After I adjusted the lighting a bit in Photoshop and cropping it to size it was ready. I was out for lunch when I saw this charm on the ground that somebody had dropped, and the grass next to it was an easy complimentary color to find to have a good complimentary color match. I hope whoever dropped the charm finds it! Placed a fresh cut bird of paradise from the backyard in a vase about 16" in front of black construction paper. Camera was on a tripod 30" from the flower. Used natural sunlight filtered through parchment paper taped to the window behind the camera. Increased saturation and contrast in iPhoto. Canon REBEL XSi, Canon EF 50mm f1.4 lens, shutter 1/30 at f/4.0, ISO 100. What better shade of orange than that of the fruit that bares the name? After carefully pealing (and not-so-carefully devouring) an orange, it was off to find a nice complementary blue at the craft store. I tried quite a few different orientations, but I thought the blue came through the spacing in the orange the best in this one. I have been doing a lot of origami lately, but rather than photograph the models, I decided to try to capture (somewhat abstractly) making origami. It warranted a new complementary nail varnish colour. I do not know much about photography but I made this photograph as a representation of Romeo and Juliet. In a new version contenporanea sweet. It was taken at my house behind a white sheet of complementary colors and sweet. I started with the idea of a plant bleeding (to get green/red) and then saw an apple and decided to create a 'crime scene' with it :D.
lens.Love this 170 dollar lens. Shot in aperture mode with -.75 exposure compensation. may not always enter but i usually follow every contest. Thanks again Mark. I enjoy a lot playing water-polo, so when i saw this week's photo challenge, i immediately thought of the complementary colors between the bright orange ball and the blue color of the pool's water. Just toss the ball in the water, and there we go! Shot on a Canon 500D, with a 50mm lens, at f5.6 and 1/250s. I was actually thinking about this challenge when I woke up this morning at my friend's place, and I noticed that he and his wife had some loofahs hanging in the shower. Dammit if they weren't the right colors! Taken with my handy point and shoot: Canon Powershot SD1300, 1/20s, f4.0, focal length 9.5mm, and ISO 400. I wish I would have had a SLR with a macro lens, but you shoot with what you have available. com·ple·men·ta·ry adj \ˌkäm-plə-ˈmen-t(ə-)rē\ : 1. relating to or constituting one of a pair of contrasting colors that produce a neutral color when combined in suitable proportions. 2. mutually supplying each other's lack 3. me and my girlfriend. Combine utter, polar disagreement on everything, ever, even on the use of a digital camera and the fact that I am the kindest soul on earth and she is a violent psychopath and what you get is a highly contrasting (complementing) picture. My girlfriend snatched my Olympus E-420 from my hands while I was trying to photograph some random kids playing with colour paper planes, and took a photo of herself to see her new (violet+blonde) hair. She forgot to erase the picture, so it ended up in gimp, getting tweaked and filtered. I showed the image to her next day and she hated it. I loved it. She broke my camera (but not my heart). So it is up to you. Do we complement or cancel each other? Original photo: Olympus E-420, 2011:09:09 17:33:12, Shutter speed 1/80, ISO 100, Auto mode, Auto flash, Zuiko 17-45mm. Actually there is not much of a story. I went outside to the sound wall close to my house where this climbing plant grows. This plant is known for turning red very early in fall, so this was the right moment to find a spot where the plant was both red and green. My name is Philip Palermo, freelance photographer (and soon-to-be laid off Software Tester). Attached to this email is my first-ever entry to your Shooting Challenge contest. Here's some details. Lighting: 2x Nikon SB-600 flashes in Manual Mode (1/4 power) mounted on 2x 43" silver reflective umbrellas and attached to the camera via a TTL coiled remote cord and a TTL extension remote cord. I'm trying to learn the ins and outs of this impressive camera so I can use it as part of my gear for a wedding next Saturday. Once I saw the Shooting Challenge theme, I looked in our backyard. I noticed our sunflowers were taking on this nice orange shade as the sunny weather winds down. With the X100's ND filter and hi-speed flash sync capabilities, I thought this would be a great chance to experiment with the camera. I am just getting into photography and this is my first entry into the shooting challenge. I was just kind of playing around in the front yard with my camera trying to take different shots of complimentary colors. However my Puggle Molly wouldn't let me get a clear shot of the apple on the grass, she likes all things that are edible and some things that are not. Anyways, I feel this turned out to be a kinda cute picture. My iced coffee had really cool shaped ice cubes in it, so I held it up to the sun to try and snag a picture. I quickly got distracted by the warm color tones of the coffee itself, and balanced it up on a fence to take this shot. contrast nicely with the grass in my backyard. This was shot on a beautiful Saturday afternoon in Chicago. My girlfriend and I went to the Renegade Art Fair and got a little inspiration to do some creative painting ourselves. I like the way this shot came out the best. Hello! This is my first time entering a Shooting Challenge, so I hope I did well! The camera I used was a Nikon D5100 with 18-55mm lens. This picture is of the engagement ring I purchased for my fiancee, and fellow commentor, ThLiLMermaid. She isn't of the traditional mindset, so no big diamond for her. Instead, she wanted a nice and rare Lightning Ridge Black Opal, for its colorfulness. So, I used the selective color effect on the D5100, had her model it, and here we are! Kind of looks like a ring reflecting space. Hope you enjoy! This challenge was an interesting because there were so many options. So since I had nothing to do today I decided I was going to do laundry and then step outside and take my camera with me. So I open up the hood of the washing machine during the rinse cycle and I immediately notice that a red and green shirt of mine are both next to each other as if they wanted me to take a picture so I pull out my T2i and take a couple shots. I set up the tripod about a foot and a half from the feeder which is frequented by my little visitors. I chose an F/36 aperture mainly for the depth of field but also the blacked out background effect. Then it was just a matter of waiting. I think the bird was startled by the sound of the lens focusing, they always seemed to be in the process of leaving though they were stationary when I triggered the remote. I knew I wanted to do something with oil and water for this challenge but was having a hard time capturing anything I liked. My boyfriend had the idea of mixing some gel food coloring with water in a shot glass and pointing an LED flashlight up from beneath the shot glass. With a little tweaking in Lightroom I think we ended up with a pretty cool effect! I've been wanting to attempt a shooting challenge ever since I bought a DSLR, but I either had never had time or didn't have any great ideas for unique photos. When I saw the complimentary colors challenge, I thought it was something I could come with a nice shot for, so I gave it a try. First, I considered what would make a nice background, and realized that grass makes a really nice background if I could find an interesting red object to compliment it. Then, while sitting at my kitchen table, I see an apple, and decide to give it a try, and this was the result. I made a few adjustments in Adobe Lightroom with exposure, temperature, and saturation. Shot with a Canon T3i with a Tamron 28-75mm lens @ 75mm, f/2.8, 1/1000 shutter, and 100 ISO. Ever since I read about the challenge, I'd been brainstorming myself for this theme. Going through all the stuff I had with me, I realized majority of it was black. So I kept roaming around the house, searching frantically for things with complementary colors.The search ended in the kitchen where I found packet of M&M lying in the fridge.Taking them out, I started searching for things to set them up on. I found 2 miniature vodka bottles, and decided to rest 2 complementing M&Ms on each bottle's mouth. But the mouth was too big for them. So, I kept searching for other things to rest the M&M, and I stumbled upon the Rubik's Cube and noticed the adjacent faces were complementing colors. And so, ended the search for the subject. Thinking about the perfect way to setup, I realized keeping the white end in front would give a nice view of the red and green. I placed a black t-shirt behind it, to complement the white of the front end. And voila, I had the perfect setup ! Only thing left now was the lights. I turned of all the lights in the room, and experimented with an LED light, a torch light and the flash. Finally, decided upon this image captured using the camera's flash, solely upon the sharpness of the colors. This was captured using Canon 1100D, non-IS lens. Exposure of 1/60sec at an ISO of 800, with focal length of 30mm, and the camera's inbuilt flash. I was inspired by the "red grape on yellow tablecloth" comment but decided to spice things up a bit. Got a red bathroom carpet, put it on a shiny table surface, and up-ended a blue-green glass bowl on top of it. Internal light is courtesy of a Droid Incredible with flashlight app and some Al foil. External fill provided by an incandescent flashlight I had to hand hold. T2i, Canon 70-300mm @ 95mm, f/10, 2.5 sec. I used a Nikon D5000 with a Sigma 18-200mm lens. My family and I are on a RV trip across the southwest. This picture was taken at a place called Antelope Canyon. It is located near Page Arizona on a Navajo reservation. When i saw you guys were doing the colors photo contest I wasn't sure if i was going to be able to get that type of shot. I truly got lucky here. The way the light reacted to the walls is nothing short of magical. The shot was taken looking vertically up the canyon. The reflection of the light makes the bright side look blue and the outer canyon look orange. Since i am on vacation i have no editing software so the picture is exactly how i took it with no modifications. What a beautiful location! Kayaking trip at Skokie Lagoons - took while drifting through the algae patches. I saw the red of the kayak & the green of the trees and algae and knew it would be a perfect compliment for this challenge. The reflection in his sunglasses was just a bonus. This image is of a music band named the Half Breed Lovers and it was taken at a local music venue. The crowd was very much into the performance and they were cheering for them. I am also an avid fan of their music and performances so I am familiar with their songs. I knew there was a part of this particular song that would involve them all singing in unison so I had the camera ready for the shot and sure enough I was able to get it! I think the picture looks amazing and I am very proud of it. Please consider this submission as the "color contest winner"! Don't know why they call them m&m's, There seemed to be a awful amount of W's, 3's and "fancy E's". I started by meticulously sorting out all the colors from about 6 pounds of m&m's. Then I drew 2 thin lines that spiraled into each other. I flipped the M&M's upside down cause I thought the "m" would be distracting. Then I started my pattern. I found myself eating the "irregular" or "chipped" ones, cause it had to be perfect. Time consuming and delicious, but it payed off. ISO 200, f/5.6, 49mm, 1/5sec. I spent the morning in the foothills shooting an area known as "Rock Garden." On the hike out I spied this very cool rock formation that had just begun to be lit up by the sunrise. I read of this week's photo challenge while processing my images later that day. a saturation tweak to the already present golden orange and sky blue was all that was needed. I've been sending the link to your shooting challenges to my whole family for quite a while now, and when I woke up this morning looking at the wines on our neighbors wall I decided to have a go myself. Red and green are obviously complementary colors and they kinda proof that nobody has been fooling around with the date in the EXIF file ;-) It's been raining the entire night, so there is some added glow to the colors. Unfortunately it also means that, due to no sunlight, I had to tweak the brightness levels a bit via aperture, but on request I am happy to provide you with the original file. At least once a week I go scorpion hunting with my black light in my back yard. After reading about this contest the and seeing how much the scorpions really pop out when the black light is shining on them I couldn't pass up the opportunity. Scorpions are great to photograph because they basically sit in one place for hours waiting for other bugs to walk near them and the black light does not scare them off. This allowed me to try many different exposure times and allowed me to get the camera manually focused in the dark. Camera was Canon 60D with Canon EF-S 18-200 - 1 second exposure at ISO200. Here is my first submission into the shooting challenge. I have always loved everything I see but I decided to submit when the blue light from my TV (with no input due to my 3rd RROD which just occurred) was hanging next to this candle. I had to get my camera and pitch in. Ok I decided to be better prepared with more time for the contest entry this time. I was torn on subject matter: do I shoot my favorite SEC team's ball cap (WAR EAGLE!) or do I go a less controversial route? What? I was thinking about the licensing aspects of the cap and how I couldn't shoot it for this contest not the team... *cough* Yeah… that sounds good. Annnnnyway, I had to make the ever present Wal-Mart run for some groceries and thought it would be a great idea to meet the needs of this challenge at the same time. I trotted off to the gift section and found some blue wrapping paper. Not just any old blue; REAAAAAALY BLUE. As in get a gift wrapped in this and wonder what you did to make the giver mad. I finished up the bulk of my shopping and on the way to the registers trolled through the slim pickings they had for flowers. I was like :/ big time. Then I spotted these very nice orange flowers in the water. Suffice it to say I bought them else I'd leave the store empty handed, except for the stuff that somehow filled my cart up along the way. Geez, I thought it was only a few items I needed. When I got home I put up the groceries and set to shooting the pic, setting up a makeshift backdrop using the wrapping paper and setting the flowers in a vase. Boom! I snapped away but something was missing. What I was looking at on my LCD was just too boring. Water to the rescue! After a few spritzes from a mister… viola! Submission complete. Picture taken of a closing lily in the small fish pond off our porch. Wish I could get one of the frogs to sit still, but they're not having it. Sony A55 52mm w/2x macro lens f8.0 -0.3exp 1600 iso.